First Lisa read (and raved) about it (more than a few times). Then Melissa did. Then Ronnica did and made the statement that the only thing she needed to say about it was: Go out and buy it. How could I possibly resist after that?! In short, this book came highly recommended to me. So I put it on my Amazon wishlist and Jonathan bought it for me for my birthday. I instantly devoured it (sharing one passage here) and then Jonathan devoured it and we both LOVED it! This book gives the church of God (and the Christians in it) a good kick in the pants. A much needed kick in the pants! 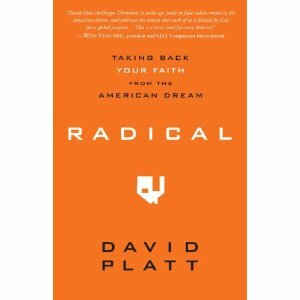 Platt writes to challenge American Christians in particular to dive into a deeper faith that might actually cost them something. Like Lisa, I'm tempted to just go on quoting the book to you in this review. Let's just say that a lot of what Platt said resonated within me and I'm excited about it. Add my recommendation to the pile. That sort of thing. This is a much needed book. This book made it to the New York Times Bestseller list. I can only hope it has an impact. Platt has a very mission minded approach to the church which is absolutely fantastic and something I'm not inclined to quibble with. We should all have a heart for missions in some form or fashion. No beef there. But I did feel like he wouldn't easily accept the idea that a mother is working her own mission field in the home. He was bent on thinking outside the home, your church family and the local community. He really does work hard to preach a global mission message and I know that has great appeal for those who do feel called to go global. I don't believe we're all called to go global in the sense that we all need to dash out and purchase international airplane tickets. Right now I'm called to the bedroom upstairs and the two little people who lay their heads to rest there. That's my call. That's my mission for the moment. And I'm not about to start apologizing for it. I think that a stay at home mother has a great work to do and her work does and will effect the future. I don't know what my children will grow up to be, but I know that I am called to act responsibly towards them at the present moment and so home truly is where my heat is - and needs to be. That's the one and only issue I took with the book, but otherwise, I think its hands down fantastic and he said some things that just needed to be said! Furthermore, he said some things that need to be heard and acted upon. Yes, I do highly recommend this read. And I feel like I'm in good company in doing so. This review linked to the I Read It carnival at 5 Minutes for Books. I'm so glad you read it! I've loaned my copy out, and really want it back soon. I'd like to refer to it every now and then when I need that kick in the pants! I didn't get the impression that Platt was minimizing the mission of motherhood. I never thought about it, actually...and it's been a while since I read it, so maybe I've forgotten or missed it. I felt that his call to be globally-minded could mean just being more aware & praying, or sending financial support if you're able. One of the main things I took away from this book was my own willingness to take my freedom to worship for granted, and turn it into a license to be entertained. In light of what others around the world sacrifice to have just bare bones worship, I should be ashamed. Amen! I love your confidence in your call. It is where God wants you to be right now, raising your little ones and taking care of the one on the way. I loved this book, too. Very inspirational and I'm so glad I had a chance to read it. Thanks for your review. Thanks...I keep hearing about this book over and over again, and he has a relationship with my pastor. I totally agree with your ending comments on a stay at home mom...I have been one for 27 years with six children. Their lives will touch more than mine every will...either for good or bad...so my first obligation is to raise them pointing them to the Lord. Glad you followed my advice. =) I think we all have our biases. Platt, as a man, can forget what a calling it is to be a mother. That said, he did mention how Christians fostering and adopting children is one way to live out our Christian faith, which is one way you are. I hope that this makes a difference, but I'm afraid it won't. I liked this article on the topic. Glad you read it. Re: what rankled, I can see how he could give that perception but I don't think he purposely excluded the mission of motherhood because he sought to intentionally minimize it. But I don't really know because like Melissa I never really considered that when I read the book. All that to say: you're right in that motherhood is your primary call and mission field and you are right to see it as your priority! Hope you are feeling better these days! Sounds like this book has a thesis I agree with. Sometimes I think that the "cultural Christianity" America has had -- which some folks want so much to "reclaim for America" -- is the worst thing that ever happened here. The gospel is more likely to regain its original sharpness and glow in the midst of adversity. Don't mean to be preaching. I enjoyed your review, and get the sense that this book has the tang of truth. Good stuff. Amen to your thoughts on motherhood, too! OTHER than that, I'm sure I'm going to love this book, and I'm looking forward to reading it.